with wooden slingshots or make beachball-sized bubbles with the Bubble Thing. 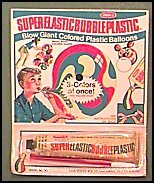 insert a small straw into, to blow up into a wildy-colored plastic balloon. head out to the backyard!